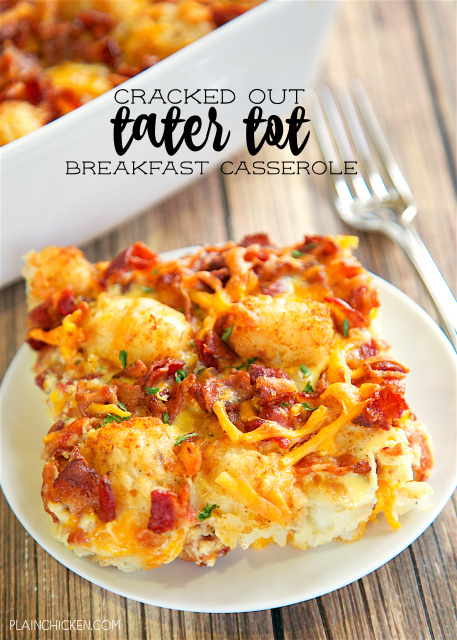 Cracked Out Tater Tot Breakfast Casserole - great make ahead recipe! Only 6 ingredients!! Bacon, cheddar cheese, tater tots, eggs, milk, Ranch mix. Can refrigerate or freeze for later. Great for breakfast. lunch or dinner. Everyone loves this easy breakfast casserole!! I was looking through my "crack" recipes and noticed that I was missing a Cracked Out Breakfast Casserole. I had to fix this oversight ASAP! 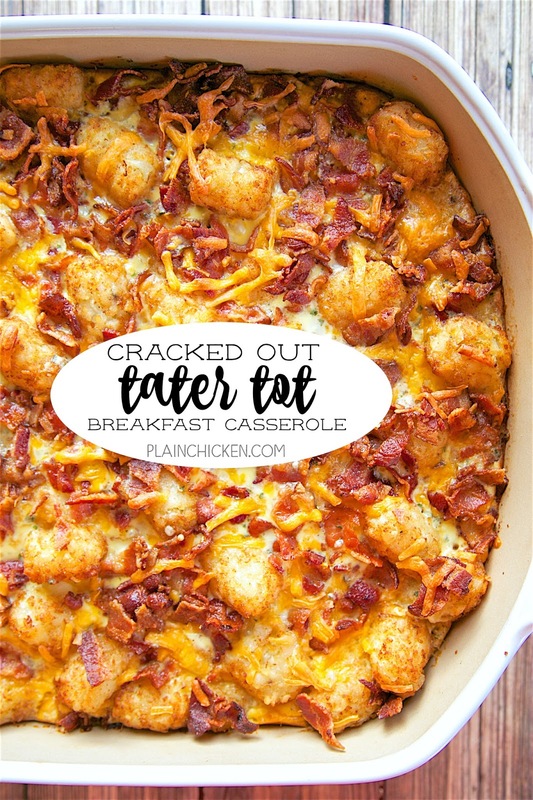 I am on a tater tot kick lately, so I decided to make a Cracked Out Tater Tot Breakfast Casserole. OMG! SO good! SOOOO good! 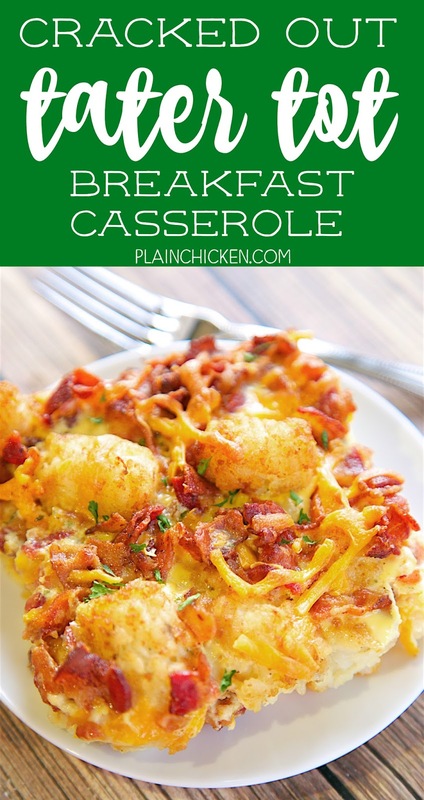 This is seriously one of the best breakfast casseroles I've ever made. Cheddar, bacon, ranch and tater tots - how could it be bad?!?! The best part about this casserole is that it can be made ahead of time and refrigerated or frozen for later. I LOVE make ahead meals!! This recipe uses two pounds of bacon. If you want to cut down on the calories, feel free to use turkey bacon. 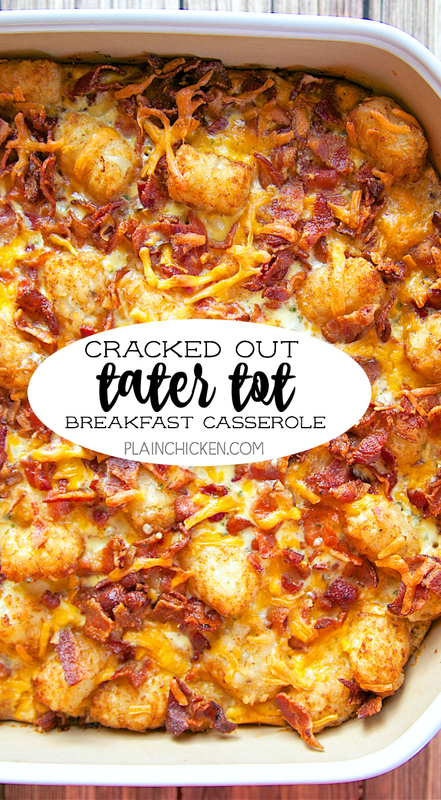 This Cracked Out Tater Tot Breakfast Casserole is great for breakfast, lunch or dinner. It is the perfect dish for overnight guests or a party. We've made this several times and everyone asks for the recipe!! In a large skillet, cook bacon. Chop cooked bacon into pieces. 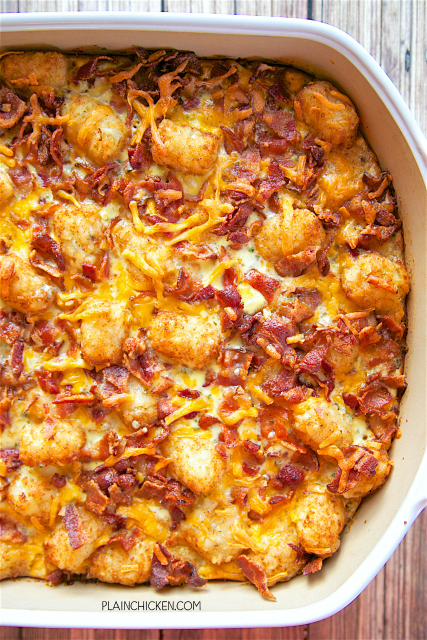 In a large bowl, toss together tater tots, cooked bacon, and cheeses. Pour into a lightly greased 9x13-inch pan. Whisk together eggs, Ranch mix and milk. Pour over tater tot mixture. Bake for 50 - 60 minutes, or until eggs are set. Holy smokes that looks good! Looks like this would be really tasty BUT 2 POUNDS of bacon!?!? Has to be a misprint! Its not a misprint. I have made this several times for several different people. Ratios are just right! It is not a misprint. I used 2 POUNDS of bacon. Feel free to adjust the recipe to your tastes. Holy moly, I already knew your crack recipes were crazy tasty but this may take the blue ribbon! I HAVE to make this soon. Oh my! We MUST make! Same question as "Unknown" from 10/15/16 . . . Do you defrost or cook the tater tots? Same question as "Unknown" has from 10/15/16 . . . do you defrost and/or cook the tater tots before putting them in casserole dish? No - I used the tots frozen. So I've made this 3 times now. Delish! My husband and 3 boys love it and have requested it several times. Ironically, I've never made it for breakfast. It's great for those nights you want breakfast for supper. I learned this from another recipe- chop the bacon up and then cook it. Makes things so much easier! I made this for a work breakfast and got rave reviews. I did add onions and just layered everything instead of mixing to save time since I was making several pans. Also cheated and used the store bought chopped up bacon. I am sure it would be more “cracked out” with freshly fried but since I was making several pans I went for the quick answer. Can you make this in a muffin tin? Hi, just wondering if anyone has made this ahead and frozen it? And if so, do you mix it together and freeze, then do first bake the day of... or bake it, freeze it, and then reheat it day of? Thanks! You can freeze it. I would freeze it uncooked and thaw it before baking as directed. Enjoy! daisy4given - have you tried it yet? I want to make it for an event but need to make it a week early and am concerned how it will turn out if it's frozen before it's cooked. I would appreciate any info. Thanks! It will be fine frozen, thawed and then baked. Do you think I could substitute breakfast sausage for the bacon? Would this still turn out if I made it 2-3 days ahead and covered/ refrigerated it? (I'm thinking of making it on a Wednesday and not baking it until Friday morning). Thanks! Could you use sausage instead of Bacon? I made this for my coworkers and it was a HIT! Everyone loved it! Even asked me for the recipe which I will share. My question though is about the ranch, in your recipe it say "1 (1oz) package Ranch dressing mix". Do you really only put ONE oz? or was that supposed to me TEN oz? Either way, I bought a 15 oz package and used about a 1/3. Please advise. Thanks! It is one small package that is 1-ounce. If you have a large container of dry Ranch mix, you would use 3 Tablespoons of the seasoning. I adjusted the ingredients to hopefully clarify that it is a 1-ounce package. Thanks! Hi! How long can you refrigerate this for? Can you add veggies and if so would you cook them or add them raw? You can definitely add any veggies that you enjoy. You can cook them or add them raw. They should cook through with the baking time. Do you think you could make this without eggs? No. You could use egg beaters if you want to cut down on fat & calories. Yeah, you'll need a different recipe. I don't eat eggs either, but I do like these type of casseroles. But a regular scrambled or fried egg is not my thing. He might like it if he tried it. My daughter made this for me... I can’t get enough of it.... and I don’t eat eggs ... however... this is delicious!! I topple it was pico de Gallo soooo good! I’m making it for dinner tonight!! So excited! Thank you!! Made this today for brunch. Everyone loved it. I only used one pound of bacon but followed the rest of the recipe. Big hit!! I'd like to make this for a belated Christmas gathering. However, I'm making another recipe that calls for the oven temp set at 375*. Do you think baking this recipe at a higher temp will affect the outcome greatly or just shorten the bake time? Can this be made in a crock pot and cooked overnight? Any guess on if the recipe could be altered to use ranch dressing (bottled)? I don't have the powder on hand and need a recipe for tomorrow. I made it for our Church (X6)...they loved it. I like crispy tater tots, can I cook them first and then make this? Or is that strongly advised against?? I’m wondering if I could do this in the crockpot? Has anyone made this with ham instead of bacon? I’m sure it would be fine with ham. Delicious!instead of 2lbs of bacon I did 1 lb of bacon and 1 lb of chicken. Delicious! Family loves it!